Dance education has the power to transform your school. Design Dance brings dance to over 1300 students ages 2-18 weekly through partnerships with schools and community centers. We focus on making an impact on our students through curriculum designed to build courage, connection, and self-awareness. Our school partners tell us we're more than just a dance program - teachers see growth in their students social-emotional learning as well: communication skills, empathy, confidence and classroom focus. Learn more about the importance of social-emotional learning. Our instructors are passionate, experienced and are lifelong learners in the art of dance education. Why partner with Design Dance? Design Dance facilitates over 100 classes per week at over 40 schools and community centers. In our 8 years, we have had a 90% retention rate in each of our partner relationships. Our polled administrators have attributed this largely to the positive experience they have had working with the detail oriented, organized and accommodating administrative support and program management at Design Dance. Each of our programs features movement games that allow students to engage in healthy and happy community with peers, improvisational activities that allow students to be themselves and create original movement free of self-censorship and technique based dance activities that allow students to grow in their love of dance. Between our classes and performances, our kids leave class happy, active and stress-free! Many of our programs integrate dance with literacy, history and cultural studies. We know when the arts are applied to classroom curriculum we see marked improvement in academic engagement and test scores. We also know that each student learns differently; Design Dance provides each student the key to success by allowing learners to digest academic information through physical learning and development. We're proud to say we've never turned down a school due to lack of funding. We're committed to finding a way to make dance education a reality for all children, regardless of age, ability, or circumstance. Through our scholarships, individual sponsorship program, corporate sponsorship program and community partnerships, we make this promise a reality throughout the Chicago area. Design Dance programs successfully address social emotional learning standards during every class period including developing self-awareness and self-management, social awareness and interpersonal skills, and utilizing responsible decision making skills. 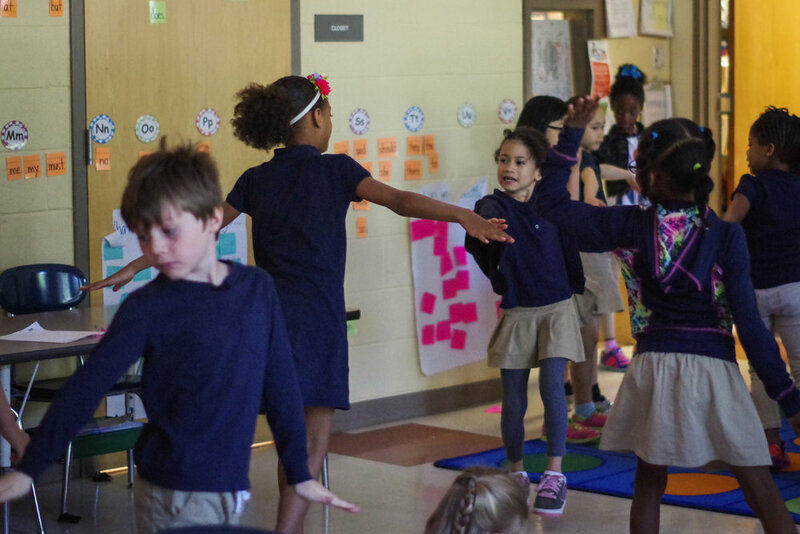 From engaging in partner dancing to utilizing performance opportunities to reinforce active and respectful listening, our students develop as part of the whole in each class. Design Dance employs an active community of dance teaching artists through mentorship and internship programs. By implementing a training program that encourages tiered development, Design Dance has built a staff of 30+ teaching artists who are committed to lifelong learning, the development of the next generation of dance teaching artists, and the curriculum and structure of Design Dance programming. J at School is pleased to collaborate with Design Dance to bring the performing arts to our Chicago Public School partners! Their approach to teaching dance is fresh and fun and the leadership and staff are always willing to try new things. Overall, their demonstrated commitment to the communities they serve is impressive. They are organized, efficient, and know exactly how their program is run. Design Dance did an amazing job of listening and collaborating with our students to provide them a unique experience. Through staff’s positive reinforcement of what skills our students brought to the table, the program came together in an amazing way. Our students’ commitment, confidence, and enthusiasm skyrocketed and culminated into a program that they felt proud of. Want to transform your school with dance? Bring the literature of your choice to life for your students as they create a dance inspired by analysis of the chosen text! Students create and embody their own self-expressive poetry, transforming it into a dance performed for the student body. In partnership with classroom teachers, students explore folk tales from around the world while learning folk dances from the areas of study. Students gain an understanding of planetary motion by embodying that motion through dance. Choose dance style(s) and bring them to your school: ballet, hip hop, modern, tap, jazz, latin, breakdance, folk, and ballroom. Professional Development teaching classroom teachers how to use dance to encourage social-emotional wellness in their classrooms.